The Argentine striker, signed on Saturday from French club Nantes for a reported fee of 17 million euros ($19.3 million), was flying to Cardiff aboard the plane that disappeared from radar around 20 kilometers north of the island of Guernsey on Monday night. A 15-hour search Tuesday covering a 1,155 square-mile area in the Channel spotted "a number of floating objects in the water," Guernsey police said. French civil aviation authorities had confirmed that 28-year-old Sala "was on board the plane." It is thought there was one other passenger on the aircraft. One of the rescuers searching for the missing plane earlier admitted they were "fearing the worst," thoughts echoed by Sala's father Horacio. A tearful Horacio Sala told the press in Progreso, where the player's family lives, that as "the hours go by and I don't know anything, it makes me fear the worst." 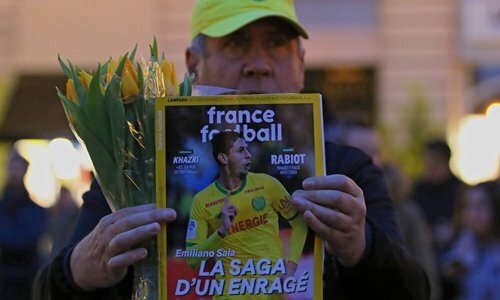 Sala, who had been at Nantes since 2015 and had scored 13 goals in all competitions this season, had signed a 3.5-year contract with relegation-threatened Cardiff subject to receiving international clearance.